Struthiomimus lived in western North America from 72 MYA to the end of the Cretaceous period 65.5 MYA. Although several excellent skeletons have been found in the earlier Judith River Formation of Alberta, the terminal Cretaceous Hell Creek and Lance Formation have produced only two incomplete specimens. 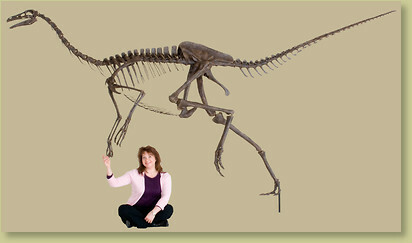 'CLAWS' Struthiomimus, an ornithomimid dinosaur, is the most complete excavated to date. Our reproduction is the only freemount reconstruction of this dinosaur presently available from any source. Obviously built for traveling at high speeds, we mount our Struthiomimus skeletons in a 'dead run' pose (pun fully intended), pushing off on one foot. Note that the steel support structure hidden throughout the skeleton, is virtually invisible. Go to the CLAWS Struthiomimus Interesting Info page for more on this specimen. Credit From the original specimen nicknamed CLAWS, collected and prepared by Black Hills Institute, and on display at The Museum At Black Hills Institute. Notes May take approximately five months for production. Check with us to see if an earlier delivery is possible.